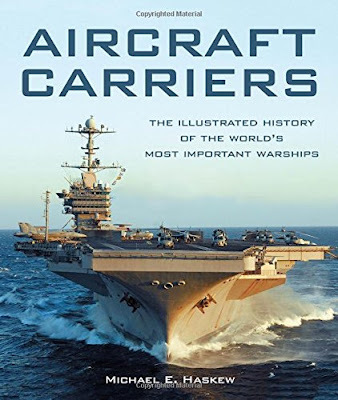 My review of Michael E. Haskew's Aircraft Carriers: The Illustrated History of the World's Most Important Warships appeared today in the Washington Times. In Michael E. Haskew’s look back at the history and development of the aircraft carrier, he notes that it was soon after the Wright Brothers’ historic flight at Kitty Hawk, N.C., in 1903 that some naval officers and civilians began exploring and developing the airplane’s military capabilities. The first successful launch of a plane from the deck of a ship occurred in 1910. On Dec. 7, 1941, Japanese aircraft launched from six aircraft carriers stationed 230 miles off Hawaii flew into Pearl Harbor and destroyed the U.S. Pacific Fleet and other U.S. military installations. Four American battleships were sunk and four others were heavily damaged. American cruisers, destroyers and other ships and aircraft were also destroyed or heavily damaged — 2,403 Americans died in the attack while the Japanese military lost 29 aircraft, a fleet submarine, five midget submarines and 185 men. Thankfully, the American carriers were at sea at the time of the attack. Mr. Haskew’s coffee-table book offers a concise history of the carrier from the Wright Brothers to Pearl Harbor, and on into the Korean, Vietnam and Middle East wars.